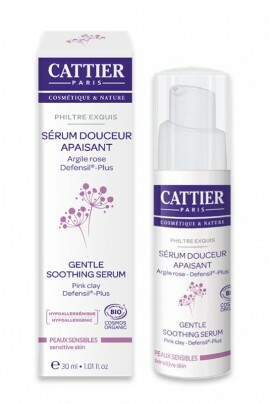 The Soothing Softness Serum immediately relieves, moisturizes and helps to combat the sensations of discomfort. Defensil-Plus, an innovative anti-irritant and protective active complex, combined with an organic extract of brown linen, protects the epidermis from external aggressions (climate, pollution, air conditioning ...), reduces the sensitivity of the skin and prevents Redness. Bioécolia, obtained from natural sugars, relearns the skin to maintain its fragile ecosystem by stimulating its natural defenses. Day after day, the skin regains its defense capital: redness, tingling and tautness are neutralized. An extract of red algae stimulates the synthesis of the hyaluronic acid naturally present in the skin for a moisturizing, restructuring action and a greater skin comfort. The pink clay, rich in minerals and trace elements, softens, soothes and awakens the radiance of complexion. The skin is strengthened, refreshed and unified. Apply before treatment on the entire face, neck and décolleté previously cleaned. Then use Cattier Skin Care.